Yesterday, I knew I was cold, but I didn’t truly believe that we would get snow. We hadn’t even had our first frost yet! When I heard sleet pelting the windows, I brought in my begonias. 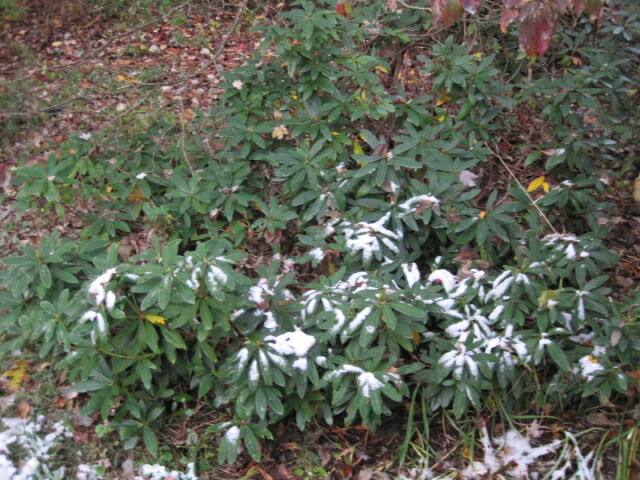 Only a short while later, there it was–flakes of the white stuff filling the air, covering the ground, blanketing the rhododendron leaves. It had been a long Indian summer; I knew I shouldn’t complain. But snow in October did not seem fair. I decided that I would sleep inside. Since June, I had been spending my nights on the back porch. I was reminded of those who don’t have shelter, the increased number of homeless and those occupying various squares and parks. I was grateful for the option. I settled into my bed and listened to the bang-bang as one cat came in (or perhaps out) through the cat door. Bang-bang. Another. Bang. There are only two cats. It’s a revolving door for them. The noise drove me crazy and the porch was probably only 15 degrees colder. Out I went. Sleet hit the windows, the wind blew. Ah! Sounds that put me to sleep. It’s 40 degrees outside, rainy and gray. Gray, gray, and my fingers are cold as I type this. Yet, I am determined to keep my heat off until November 1. I figure, if I am heat-free May through October, that’s half the year and pretty impressive for Connecticut. It’s been easy so far, Today, though, it’s a challenge. Ramos, the black cat, is crouched under my desk lamp looking for heat. I sit crosslegged and hooded to try to conserve heat. I made soup and grilled cheese for lunch looking for inner heat. It’s only a hint of what’s to come. Ah, New England, my home. Bring it on. It’s October 15 and we haven’t had a first frost yet. I’m not complaining. Impatients and petunias are still blooming and early evenings have a quiet softness to them that is missing in the humid summer or the crisp fall. We had heavy rain yesterday and I can hear the gushing of the creek, forcing its swollen way over rocks and through crevices. Yellow pine needles cover the ground, as do shed maple leaves. Not much color, perhaps due to Tropical Storm Irene or the lack of cold nights, but they are a reminder of what’s to come. All the premonitions of true fall urge me to appreciate this warm, luscious weather while it’s here. Change is inevitable, the seasons remind us of that. Welcome them all with open arms. It’s that time of year when the squirrels ignore their natural fear of human machines and focus instead on their survival mechanisms. But it backfires, as they rush from nut to tree, darting in front of oncoming cars. Mile after mile, gray tails flap on the pavement, fanned by the turbulence of passing vehicles. I hit one today. It came out of nowhere, along side my car and eventually under. The dull thud sickened me and I exclaimed instinctively, “I’m so sorry.” Did that help anything? Don’t know, but it was a genuine and visceral. Survival of the fittest? Perhaps. Did I need to slow down? Always. Could I have avoided it? Probably not. But it left a bad feeling in my heart. Last night, I was sitting outside after sunset. Just sitting. My mind quieted and eventually I heard them. Crickets filling the air with their chirping. As I listened, I felt that their chirping, the pulsing, was like the beating of the Earth’s heart.